A special passion of mine is to look for rocks or glass that range from the ordinary to the interesting. 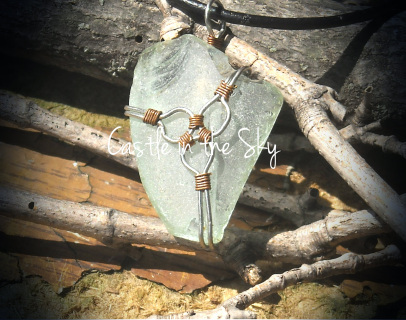 I then wrap them with wire to bring out the beauty that I can envision when I pluck the rock or glass from its resting place. This page is dedicated to the beauty that is usually passed by. 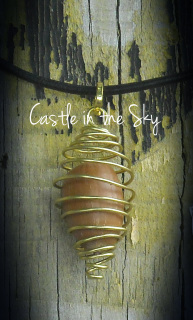 All pendants are hung from leather cord with slide knots which make them fully adjustable. A quartz stone with some gray coloring didn't need much more that a few wraps and some silver beads. Quite beautiful on its own but stunning with the additions. 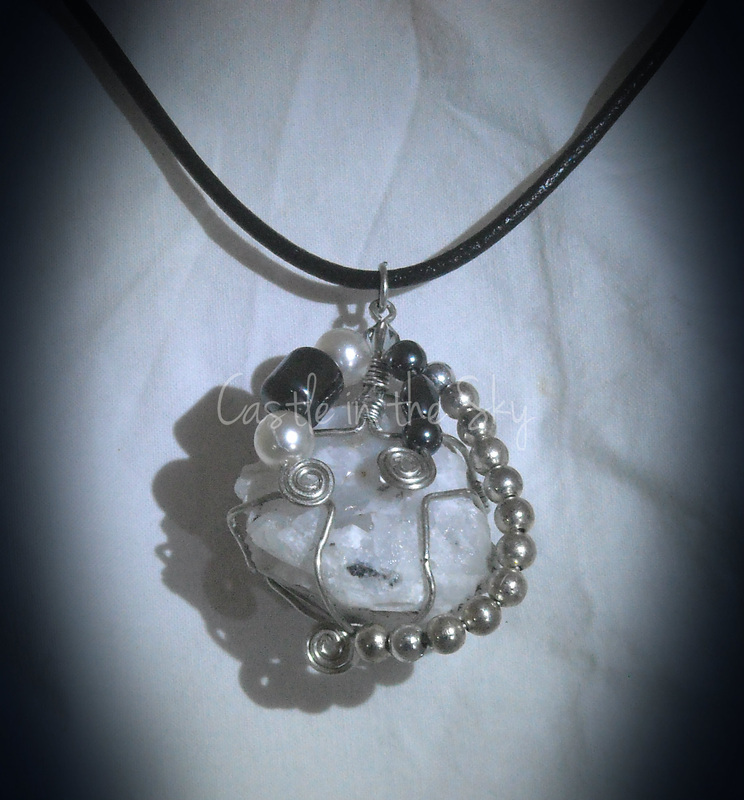 White quartz stone, silver wire, silver and black beads, and faux pearls. 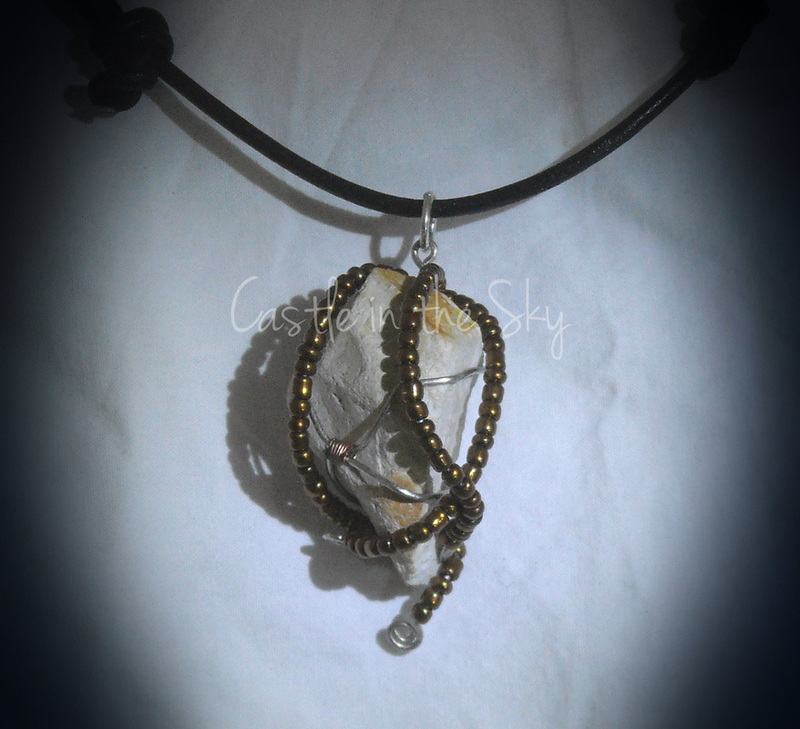 Copper beads snake around this triangular shaped stone like trails through the rock. Pockets of concaves on this stone. Add some wire, copper beads and a topaz Swarovski crystal to highlight the shadows of the stone. Black and ivory stone wrapped with black wire and accented with small, acrylic pink beads. 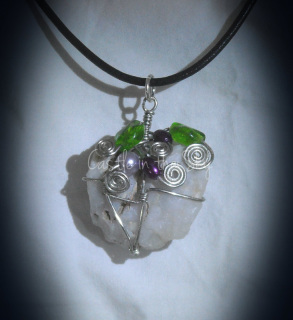 Another quartz stone this one with silver wire, purple and green acrylic beads with a few spirals for accents. A quartz-like rock found on the side of the road. It spoke to me that it wanted to be beautiful. Wrapped with silver with purple and pearls dangle down the sides. Threaded on an adjustable leather cord. This oval stone is slate, I believe (I can tell you it's a perfect skipping stone). 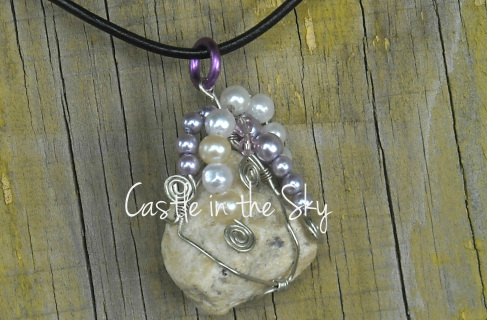 The red beads and faux ivory pearls bring out the natural color of gray and ivory. Another one of the larger stones. 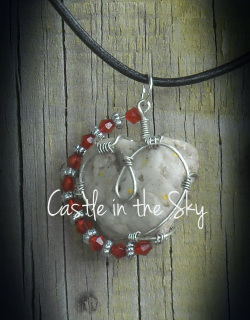 A perfect pendant for the Christmas season. 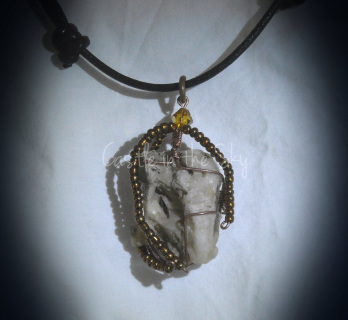 Quartz wrapped with silver with gold accents. 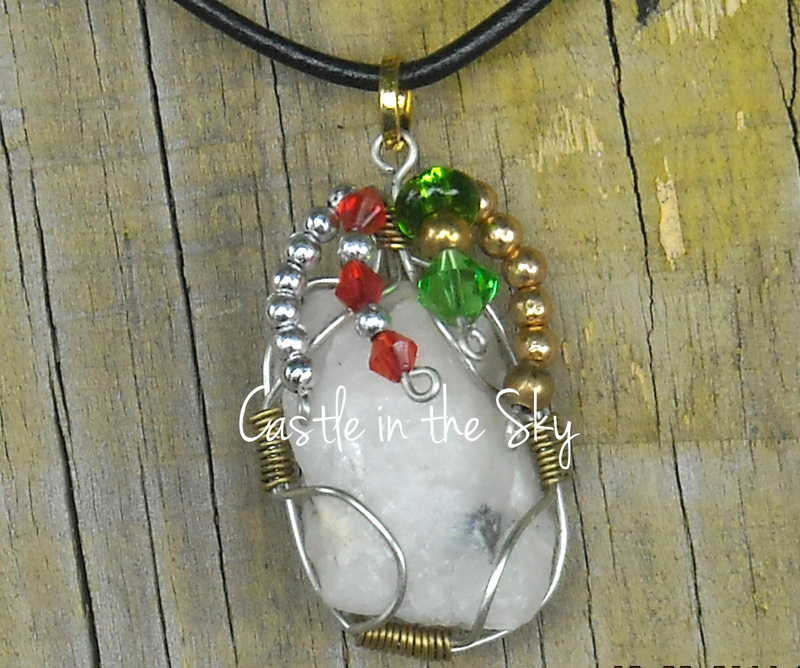 This pendant has red and green crystals and silver and gold beads. This one reminds me of a popular song sung by Burl Ives. It is threaded on an adjustable leather cord. Stone tends to speak to me that it wants to be made into a beautiful piece. 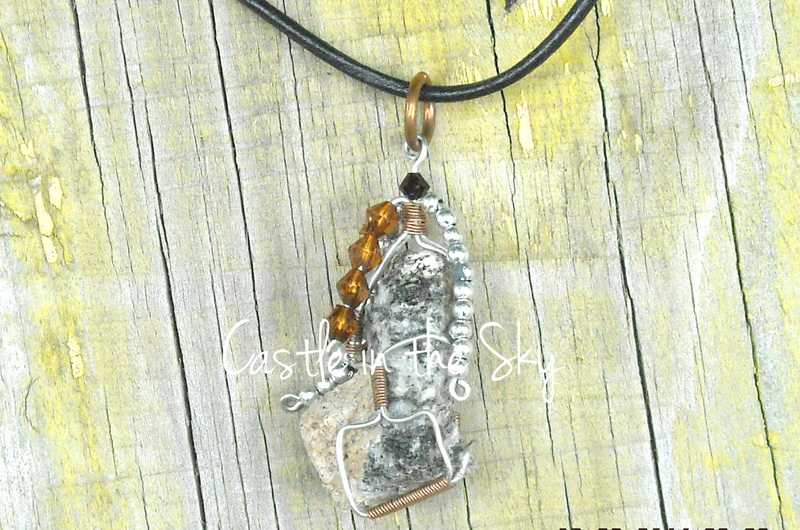 This one wanted copper crystals and silver beads. 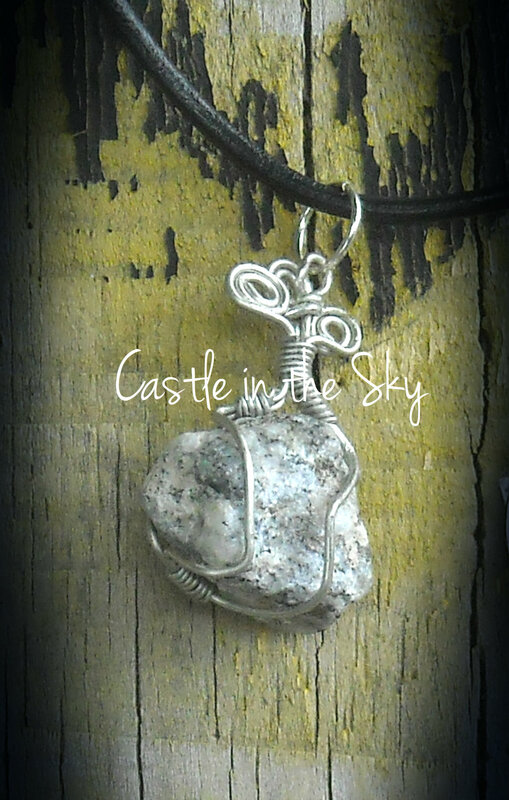 Wrapped in silver to enhance the stone and threaded on an adjustable leather cord. Sometimes a simple caged stone is needed. This stone is a tumbled river stone. Cage is sterling coated wire. 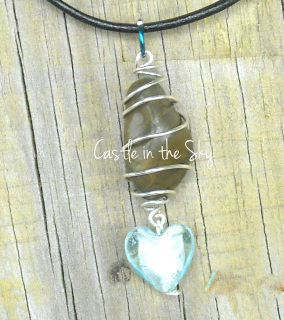 Just for an added beauty, a glass heart dangles from the bottom. 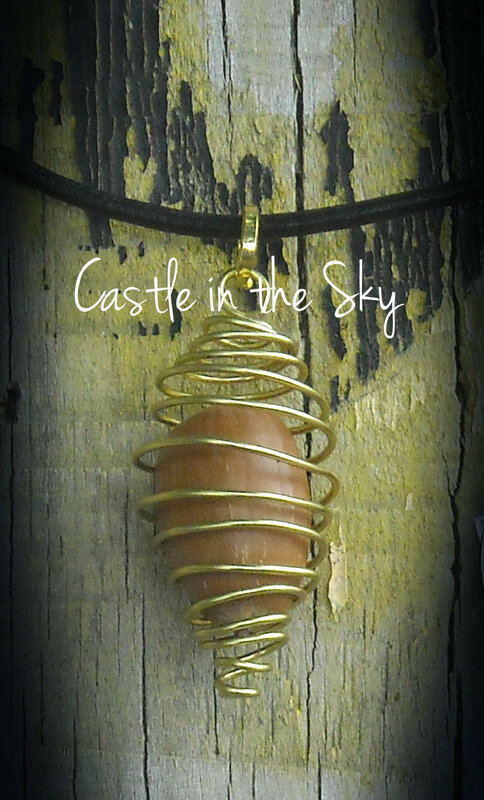 This pendant is threaded on an adjustable leather cord. This beautiful white stone is wrapped in black wire. The dangles are purple crystals and also clear crystal shards. Threaded on an adjustable leather cord. 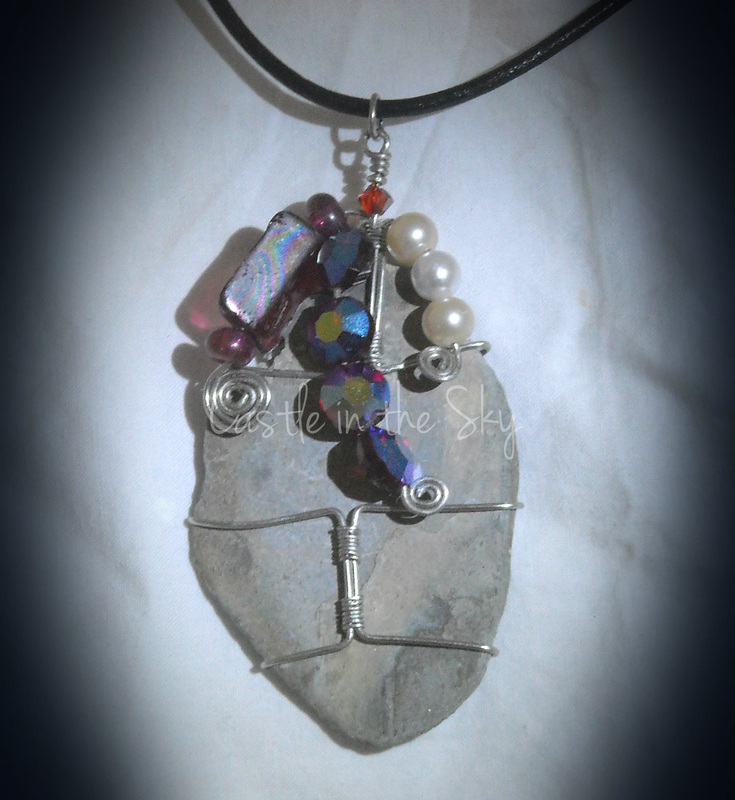 A quartz stone that is sort of shaped as a heart prompted my imagination to wire a heart on it. 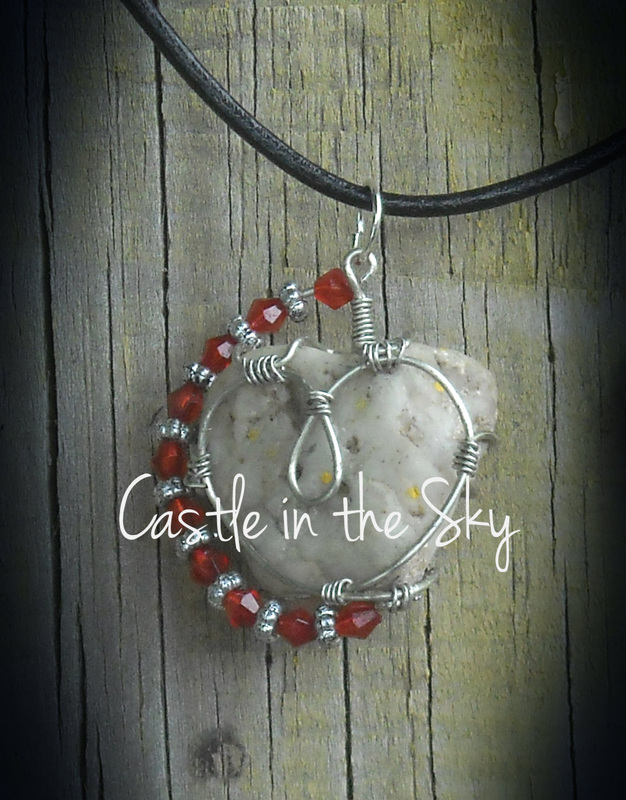 Then I decided that it needed a tad bit more, so I added a cascade of red and silver beads down the side. 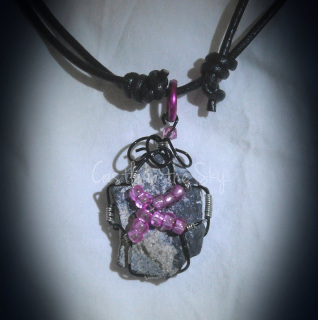 A one of a kind as all the other pendants and laced on an adjustable leather cord. Yes, you read that right...there is an acorn inside that gold cage. As I was walking one day, I was looking for something unusual. When I saw some acorns, I thought they'd make great and quirky pendants! 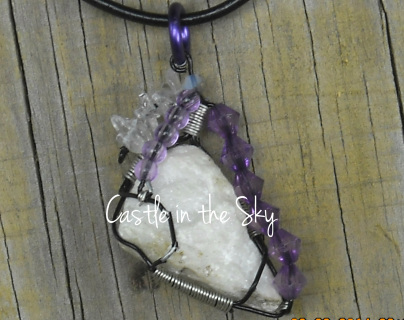 So here is one that I made up and strung on an adjustable leather cord. 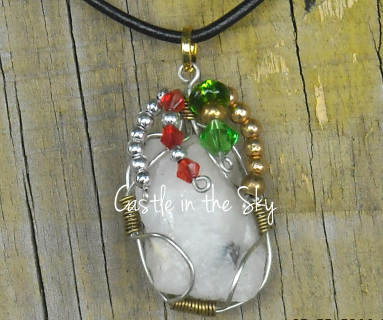 Sometimes, the smaller quartz rock make for a nice a simple pendant. This one has a couple of simple wire lines in the front that end in swirls at the top. Threaded on fully adjustable leather cord, if you want a simple pendant, this is it! Delaware River sea glass. This piece, shaped almost like a triangle, called for three circles meeting in the middle. Silver wire circles are tightly wrapped with thin copper wire. The patina is natural. Delaware River sea glass. 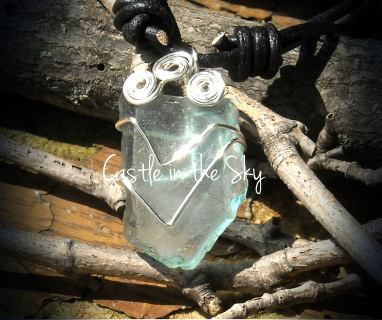 Using silver wire, I followed the natural shape of the glass. At the top, I added three swirls to soften the angular shape. 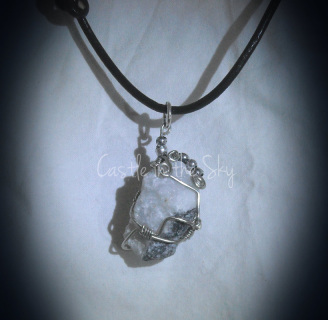 Necklace is fully adjustable on a leather cord. 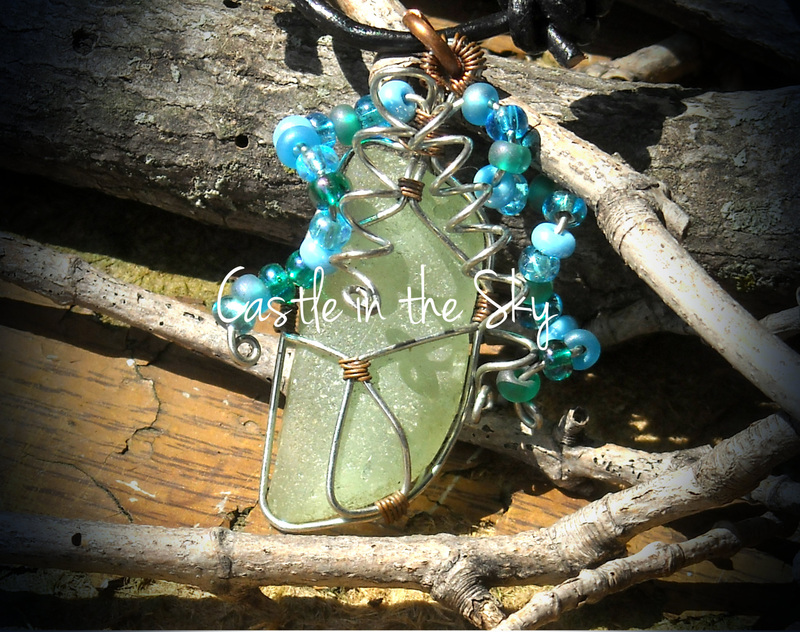 Delaware River sea glass. A simple wrap winds up the glass in to a flourish of blue beads and silver cascading down.